The last time I visited India was in 1989, 25 years ago. Both Rob & myself joined a group of about 25 people touring India for 3 weeks to all the well known sights including Delhi, Agra, Jaipur & Mumbai. We arrived back in Delhi this time on 27th December for our inspection trip to Northern India, including Shimla & Amritsar. Delhi airport has greatly changed for the better! The weather I remembered was hot in September but it is much cooler in December. In fact Delhi was experiencing a cold December with a lot of fog. 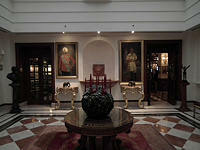 Our India office had arranged for us to stay at the 5* Taj Palace hotel. This is the sister hotel to the 5* Taj Mahal Hotel also in Delhi. The marble floor in the entrance and lobby areas, the antique furniture & gas lamp shaped brass light fittings offer an elegant place to stay with hints of the Raj - the lobby lounge also offers daily afternoon tea with cake & sandwiches reflecting the strong British heritage in India. The room was large and very comfortable with a luxurious, large bathroom having a very good shower & elegant bath. The restaurant buffet was memorable with excellent choices of international cuisine & local Indian dishes. The seafood salad was beautiful so were the fish & meat curry dishes. There was even a sugar-free desert catering for all customers. 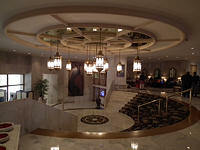 We are using this hotel in our Deluxe hotels category. Next day we spent the whole day visiting many other hotels in Delhi. The first was Clarion Collection. This is a nice medium sized 4* hotel with modern & elegant décor throughout the hotel. There is also a large swimming pool to relax in the summer heat of India, although it was not being used today as it was quite cold! 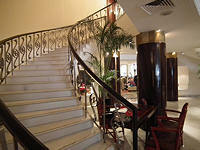 We are using this hotel in our Superior category along with another 4* hotel, The Suryaa. 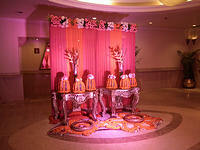 This is a larger hotel than Clarion Collection and decorated in a more traditional Indian style. It has a local charm about it especially on that day we visited as there were colourful preparations being made for a wedding. December is a popular month for weddings. The Claridges Hotel is a most elegant hotel with a pleasing 50's vibe, surrounded by green lawns. On the day of our visit (Sunday) the lawn in front of the hotel was busy with many guests who come for Sunday Brunch for which The Claidges is famous. The sales manager kindly invited us to stay for a lovely lunch at their 'Pickwicks' restaurant, with seafood soup and delicious lamb curry served with light and tasty freshly made nan bread. The hotel also houses the well-known 'Dhaba' restaurant, named after a highway truck stop. Although we did not try it that day the smell of herbs & spices was wonderful as soon as we entered the room. Another grand hotel from yesteryear is the The Imperial hotel, one of the most famous hotels in Delhi. The hotel is housed is an art-deco style building, but inside The antique furniture, grand fireplaces, beautiful rugs, historical paintings & prints on the wall plus beautiful displays of flowers & vases are reminiscent of a grand English country house. The bedrooms are large with high ceilings and elegant decor. There is also an inner courtyard restaurant serving daily English traditional afternoon high tea. The art-deco style of the outside of the hotel is most closely refected in '1911' bar, with its magnificent deco stained glass windows & doors. This is a special hotel & we are using it in our Special hotels category. On the third day the weather in Delhi and other parts of Northern India was a little worse. 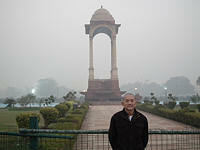 With an unusual overnight low of two degrees in Delhi, the fogs had also returned. Although the fog was not thick enough in Delhi to cause driving problems, and burned off quickly as the morning progressed, there were some problems with planes and trains. We had read the news the day before that some flights and trains had been delayed although we had arrived in Delhi on time two days ago in bright sunshine. And today, there was a problem for our travel to the Northern part of India by train.